Leading Manufacturer of coffee roaster, coffee pulper and coffee huller from Chennai. 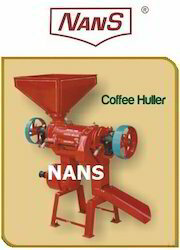 `NANS’ Brand Coffee Roaster are of robust construction, simple and compact in design with best workmanship, incorporating all the most up-to-date indigenous methods of roasting. 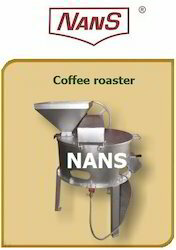 `NANS’ Coffee Roasters can be fitted with Electric Heater also. REQUIRED5 – 6 KGS.12 –1 5 KGS/HR4.5 KW½ + ½ HP10 – 12 KGS25 – 30 KGS/HR8 – 10 KW1 + ¼ HP15 – 17 KGS40 – 50 KGS./HR13 KW1 + ½ HP20 – 22 KGS60 – 70 KGS/ HR18 KW1 + ½ HP25 – 27 KGS80 –90 KGS./HR24 KW1 + ½ HP30 – 32 KGS90 – 100 KGS.HR30 KW2 + ½ HPSuitable for Roasting Cocoa beans, Coffee beans, Cashew nuts, Tobacco, Peanut etc. 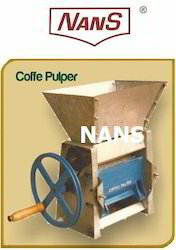 “NANS” Coffee bean roaster with automatic stirrer. 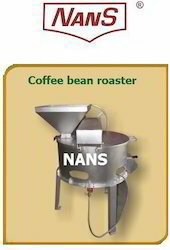 Our “NANS” brand Coffee bean roaster is specially designed with automatic stirrer for even roasting. Heating unit is with the help of LPG (liquid petroleum gas), which make the roasting economical & therefore making the roasting profitable. Simple & easy to operate as it has a automatic stirrer. Capacity ranging from : 10 – 100 kgs per batch. We are Leading national award winning Manufacturers & Exporters of Agricultural & Food processing machineries. The world renowned brand owners of "NANS" & "REEJA". Country of orgin India. Kindly visit our website www.thomaseximp.com to knwo more about us. .
no. Of cylinder`nans’– 101hand operated150-300 kgs/hr. Looking for Coffee and Les Machines ?